In May 2008, we derived the theoretical symbol error rate for a general M-QAM modulation (in Embedded.com, DSPDesignLine.com and dsplog.com) under Additive White Gaussian Noise. While re-reading that post, felt that the article is nice and warrants a re-run, using OFDM as the underlying physical layer. This post discuss the derivation of symbol error rate for a general M-QAM modulation. 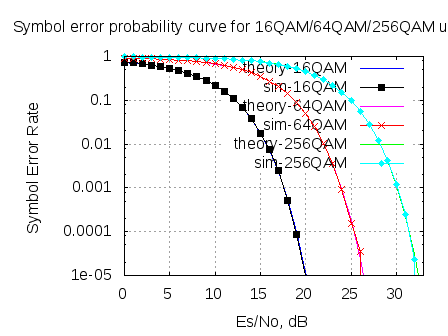 The companion Matlab script compares the theoretical and the simulated symbol error rate for 16QAM, 64QAM and 256QAM over OFDM in AWGN channel. Enjoy and HAPPY NEW YEAR 2012 !!! Quadrature Amplitude Modulation (QAM) schemes like 16-QAM, 64-QAM are used in typical wireless digital communications specifications like IEEE802.11a, IEEE802.16d. In this post let us derive the equation for probability of symbol being in error for a general M-QAM constellation, given that the signal (symbol) to noise ratio is . 1. 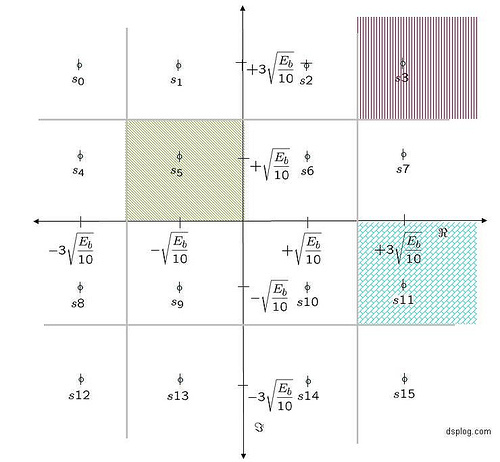 Half the bits are represented on the real axis and half the bits are represented on imaginary axis. The in-phase and quadrature signals are independent level Pulse Amplitude Modulation (PAM) signals. This simplifies the design of mapper. 2. For decoding, symbol decisions may be applied independently on the real and imaginary axis, simplifying the receiver implementation. Note that the above square constellation is not the most optimal scheme for a given signal to noise ratio. (b) Each alphabet is used times in the M-QAM constellation. From the above explanations, it is reasonably intuitive to guess that the scaling factor of , which is seen along with 16-QAM, 64-QAM constellations respectively is for normalizing the average transmit power to unity. 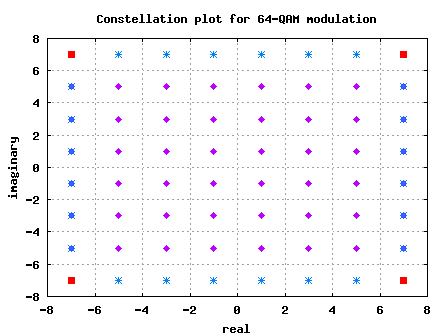 For computing the symbol error rate for an M-QAM modulation, let us consider the 64-QAM constellation as shown in the figure below and extend it to the M-QAM case. For example with M=64, there are 36 constellation points in the inside. 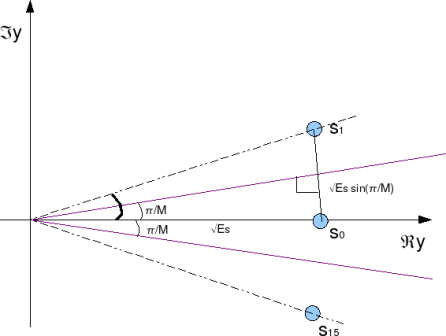 For example with M=64, there are 24 constellation points in the inside. (a) Find the probability that the real component lies from to . (b) Find the probability that the real component lies from to . (c) Given that the total probability is always 1, for finding the probability of the real component lies within to , subtract the sum of (a) and (b) from 1. As can be seen from the above figure, the symbol in the inside is decoded correctly only if real part of lies from to and the imaginary part of lies from to . For finding the probability that the real component lies from to , one can integrate the probability distribution function of the received symbol. As can be seen from the above figure, the symbol in the inside is decoded correctly only if real part of lies from to and the imaginary part of lies from 0 to 2. (a) Find the probability that the imaginary component lies from to . (b) Find the probability that the imaginary component lies from to . (c) As the total probability is 1, for finding the probability of the imaginary component lies within to , subtract the sum of (a) and (b) from 1. Given that we have computed the individual symbol error probability for each of the three types of constellation points, to find the joint symbol error rate we compute the average error i.e. Simple Matlab/Octave script for computing the symbol error rate for 16QAM/64QAM and 256QAM modulation scheme in additive white gaussian noise channel over OFDM. sir plz help me..I need a code for SNR VS BER of different modulation scheme with code rate 1/2 and 3/4.how can i change the code rate.? @anjali: which coding scheme are you using – convolutional coding? How can we change the code rate in BER vs SNR simulation? I am trying to simulate SNR of 16-QAM (under Rayleigh fading channel). Any advices on how should I work on as I faced difficulty to generate the matlab. @Jeremiah: That should be relatively easy to code up. The example with BPSK + Rayleigh channel might be of help. The MMSE BER curve is actually higher than the ZF BER curve if I use 16 QAM, but when I use in the same program QPSK I get the normal result (MMSE better than ZF)??? I used all the scaling factor that i found in your posts on ofdm and 16QAM and I added to the received signal the noise as 10^(-EsN0dB(ii)/20)*n.
using modulate and demodulate command. I tried to use one tap channel but I get the same result so I think is not becuse I should use some taps at the equalizer.What I mean is that with 16QAM in Ray channel can one tap MMSE equalizer be worse than one tap ZF or I miss some scaling factor in the equalization or in other parts???? 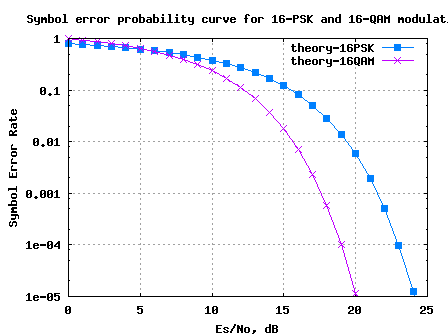 To give you a better idea of what I get I attached the link below of the curves that i get when I use QPSK and 16QAM in OFDM with the same parameters (CP,nBits etc..). In QPSK case I get perfectly identical BER for ZF and MMSE. Could it be because of MMSE have only one tap and if I d use 3 or 5 taps MMSE curve will be lower than ZF one?? @riccardo: Why is MMSE so poor for 16QAM case? Is the noise variance term in order? @riccardo; Should we use scaling of 1/10 for the noise variance? I did it and it looks better but still ZF outperforms MMSE. Here is the ber. However, I know I’m missing something stupid but I can’t figured it out…Would you mind having a further look to the whole program which work for QPSK but not for 16QAM? I send send an email and we can try to sort it out. I sent a email to you with the code. Can you please advise me , how can i modify this code to use QPSK modulation along with the QAM modulations. I am in desperate need for my project to observe different types of modulation schemes on OFDM system. @Mostafa: Try putting M=4 in the simulations for QPSK. first of all thanks a lot for your efforts. I am new in matlab and I want to ask you about some instructions in your matlab code. 1/ the term (nFFT/sqrt(nDSC)) is for scaling the output power. the term fftshift() is to provide the frequency domain information in the way ifft() likes. thanks a lot Krishna Sankar. at OFDM, increasing FFT size , how about BER curve?? and why?? @doojin: For the same sampling frequency, increasing the fft size means that the subcarrier spacing is narrower resulting in a lower noise power. However we need to lower transmit power of each subcarrier by the same amount to keep the transmit power a constant. Hence, I reckon there is no Eb/N0 vs BER impact by increasing the number of subcarriers. hello.thank you very much for matlab code 16-QAM. i am sachin. i need some help from you. i need matlab code for ostbc over nakagami-m channel or BER for the nakagami-m channel.waiting for your feedback and your help. i am imran. i need some help from you. i need a theoretical formula of Bit Error Rate or Symbol error rate for 16-APSK (amplitude phase shift keying). i got the simulation result . but i dont know the exact theoretical formula or equation regarding of this problem. I saw some of your updated formula for 16-QAM or 16- PSK. i want the like this formula where i can compare my theoretical and simulation constellation plot. waiting for your feedback and your help. Thanks Krishna for your feedback. i would like to request you, please give me some suggestion where i can get this information. Honestly i need desperately this 16-apsk theoretical formula for BER or SER. you should write about Es : Es_max, Es_min, Es_avrage. Do you know the formula for OFDM based on 64QAM modulation? @ofir: Hmmm… the underlying equation for 64QAM will remain the same even in OFDM case. The presence of cyclic prefix, guard subcarriers will mean that the noise scaling needs to be adjusted appropriately. No it will not. In OFDM there are 48 subcarriers of 64qam tansmitted. It changes the SER. The more subcarries you add the bigger the bandwidth becomes, the longer Tsymbol is. you have a mistake on “K”. it does not equal to SQRT(1/(2/3*M-1)). @ofir: Hmm… it is SQRT(1/(2/3*(M-1))). Where do you see the error? I calculated it and it’s equal to: k=SQRT(1/(2/3*(M-1))). Conversion to double from cell is not possible. @ofir: At last, I understood your concern – and I added bracket’s around (M-1). Thanks for pointing that out. It was a typo from my side. please help me simulation the difference between DVB-T and DVB-T2, i am not good at MATLAB, i have searched a document but i can’t do it because i don’t know how to write progam with matlab. @thang: sorry, wont be able to help you with the coding part.